There is a great opportunity for more holiday experiences with a good combination of adventure and relaxation, as the yachts are placed in three different destinations, namely Antibes, Barcelona or Split. The beautiful French coastal town of Antibes is located between Nice and Cannes. The old town is very charming with small alleys and streets that has cosy restaurants, exciting shops and small squares. 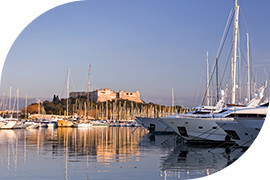 The cultural life in the area of Antibes is very rich. There are several beautiful sandy beaches along the coast of Antibes. The Principality of Monaco on the north coast of the Mediterranean is an obvious destination from the harbour in Antibes. There is great a opportunity to discover the different cultures, as you are surrounded by France and just a few kilometres away from Italy. You can experience the Formula 1 Grand Prix in Monaco and feel the adrenaline when a Formula 1 car passes by. Cannes is a beautiful and charming seaside city and is probably most known for its film festival, where celebrities from all over the world participate every year. The city has an exclusive atmosphere all year long, especially along the seafront “La Croisette”, where luxury hotels and stores are located side by side. Barcelona is located on a slope tilted towards the Mediterranean Sea. The city is a fine mix of beautiful architecture, good food and great atmosphere. It is possible, from Barcelona, to explore the Balearic Islands, such as Mallorca, or sail down the beautiful Spanish coastline. Mallorca is the largest island of the Balearic Islands. With its beautiful scenery, isolated beaches and delicious food, the island is one of the Mediterranean’s most popular destinations for sailing holidays. Croatia’s second largest city, Split, has direct access to the calm waters of the Adriatic Sea. The area around Split is known for its beautiful nature and its crystal clear blue waters. There are many different islands around Split. Towns, that has centuries of old history, with exciting shops and good restaurant. Other islands are still uninhabited. All yachts are equipped with snorkeling equipment, so you can jump in the water without difficulty and enjoy sea turtles and colourful fishes. There is no diving equipment on the yacht, but we have good contacts with local diving companies that can take you, your friends and your whole family on a fantastic underwater experience. Many of the yachts are equipped with jet skis and it will therefore be possible to sail out and explore smaller places. The experience is unique and exciting. In addition, all the yachts are equipped with various water sports activities such as paddleboard and kayak.